“Google Dashboard” is one of the unknown features which has a lot of potential uses for most of the people. To those unaware, it gives a gist of all the Google services information you use in one long neat list. For example, take Gmail, you can see your most recent mail, the total number of conversations in inbox including sent mail and number of chats. This info varies from service to service. Note that Google lists out only the top queries made by you for the last 28 days. Go to Google Dashboard and scroll down till you see “Search History” header. Click it to expand. If you prefer to take the long route, go to Google My Account > Personal info & privacy > Scroll down for Google Dashboard. In Android, go to Settings > Google > Personal info & privacy > Google Dashboard. That’s it! Here you can see your top ten queries. Above the top queries, it displays an overview of your Google searches such as most recently searched query in the web, images, and maps. You can also see the total number of searches and there is a search frequency indicator in percentage. To the side of it, there is a bar chart where you can hover to see the number of searches made on a particular day. 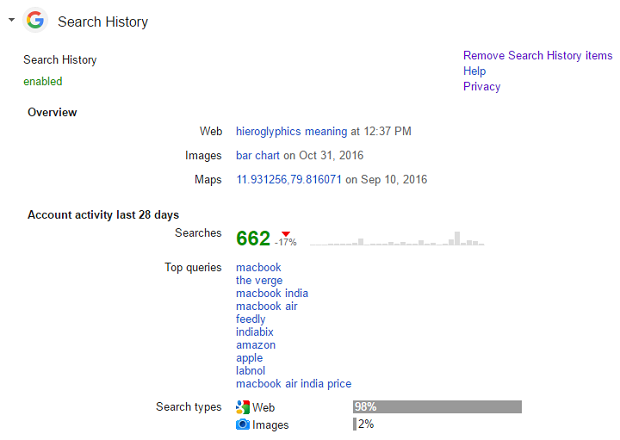 You can also see the percentage of searches in Web as well as images search. Do note that, only if you have turned on “Web & App activity” in Google Activity controls, you can see this info. Otherwise, turn it on and check after some time after you finished searching more number of queries.